Twiggs Smoothed Momentum is a smoothed version of the proprietary Twiggs Momentum oscillator. Its purpose is to provide a slower, less erratic signal for following long-term trends. 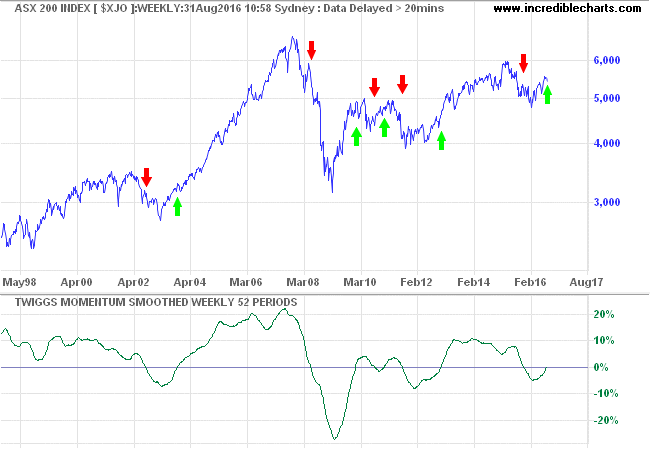 Twiggs Momentum Oscillator and Twiggs Smoothed Momentum are proprietary indicators developed by Colin Twiggs. Values greater than zero indicate an up-trend. Values less than zero indicate a down-trend. Divergences from the price chart may also warn of trend changes. Stocks with the highest momentum values (e.g. the top 10) are selected. 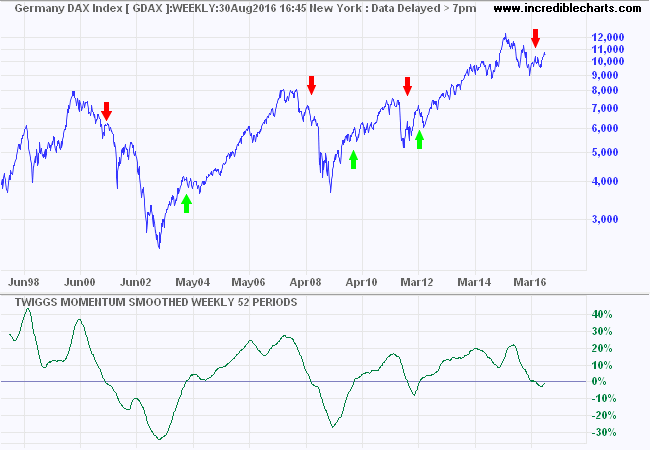 Stocks are discarded when their momentum values decline outside of the top ranking (e.g. the top 10). 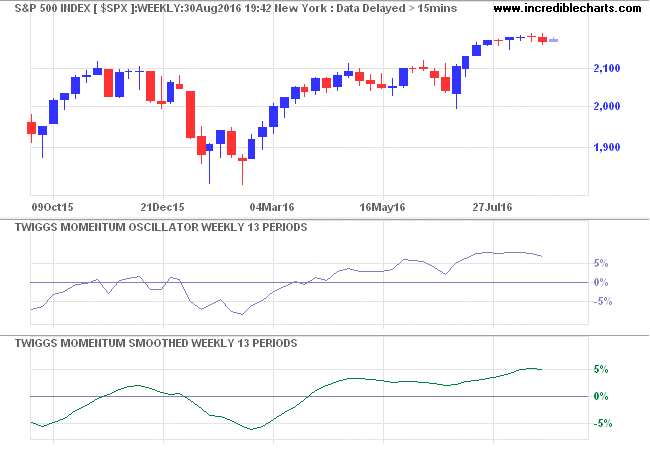 A weekly chart of the S&P 500 index illustrates the difference between Twiggs Momentum and Twiggs Smoothed Momentum. While Twiggs Momentum reacts faster it is more prone to whipsaws. In the past year there are 3 trend changes (above/below zero) for Twiggs Smoothed Momentum compared to 9 for Twiggs Momentum. When tracking trend changes, most investors are prepared to sacrifice responsiveness in order to minimize whipsaws. 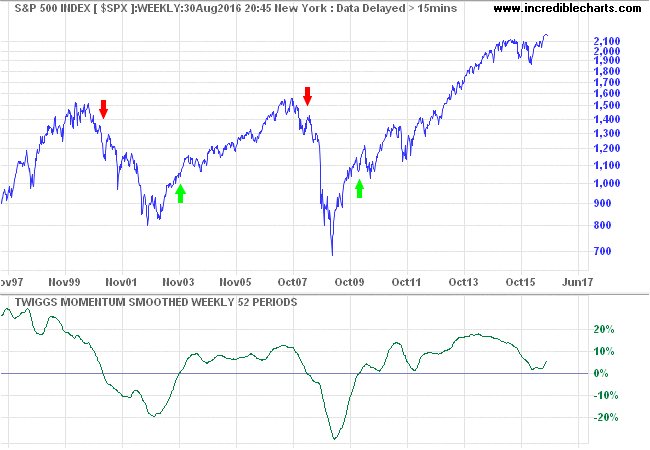 Here 52-week Twiggs Smoothed Momentum is used to track the primary trend on the S&P 500 index. There are no whipsaws on the S&P 500 index and Dow Jones Industrial Average over the past two decades. But no indicator is perfect. There is a false in 2011 on the DAX. And on the ASX 200 in 2011. Select Indicators and Twiggs Momentum Smoothed in the left column of the Indicator Panel. See Indicator Panel for directions on how to set up an indicator. To alter the default settings - Edit Indicator Settings. Open the legend by clicking "L" on the toolbar or typing "L" on your keyboard. Adjust individual colors by selecting the color patches next to each indicator line in the legend. 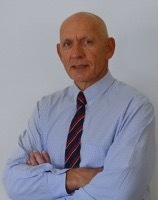 Manage risk and improve your market timing with Colin Twiggs' weekly review of the global economy.